The Battle of Gully Ravine (Sığındere) was a World War I battle fought at Cape Helles on the Gallipoli peninsula. By June 1915 all thoughts the Allies had of a swift decisive victory over Turkey had vanished. 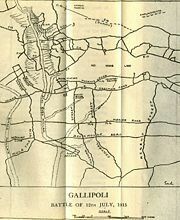 The preceding Third Battle of Krithia and the attack at Gully Ravine had limited objectives and had much in common with the trench warfare prevailing on the Western Front. Unlike previous Allied attacks at Helles, the Gully Ravine action was largely successful at achieving its objectives though at a typically high cost in casualties.